Barcodes have become the default tool to use when tracking any kind of product or process due to how easy they are to implementation and the increased efficiency they provide. What once would have been done with paper and pencil, now a simple scan can do the same only faster and more accurately. With the help of scanners from Motorola, you can improve any process from asset management with an MC9190-G or simple attendance tracking with an LS2208. This infographic is a great overview of some of the most common tracking applications and how barcode scanning makes things easier and more accurate. 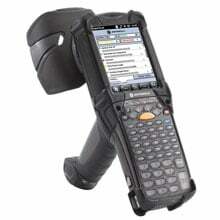 For help finding the right scanner for your needs, contact us at BarcodesInc. Motorola, a leading provider of mission-critical communication solutions and services for enterprise and government customers, has announced that it is expanding its enterprise mobile computing portfolio to include devices built on the Microsoft Windows Embedded 8 Handheld platform. This expansion brings Windows Phone 8 technologies to enterprise customers, providing an innovative addition to Motorola’s portfolio of devices built on the Windows Mobile and Windows Embedded Handheld 6.5 platforms and enhancing Motorola’s future solutions. Motorola announced their new high-performance MC9190-Z RFID mobile computer, designed for demanding medium- to long-range applications in industrial environments. Ideal for manufacturing, warehouse, and transportation and logistics applications that require reading tags that are often out of sight or more than 10 feet away, the MC9190-Z is one of the longest-range RFID handhelds in its class available on the market. The MC9190-Z handheld RFID reader leverages Motorola’s unique long-range linear antenna that enables more accurate data capture. The ergonomic features of the MC9190-Z also allow more frequent and accurate inventory-counts to better manage on-the-floor, back-room, warehouse and distribution inventory – reducing out-of-stock and excess inventory carrying costs. With a rugged design to handle indoor or outdoor environments and offering multi-modal data capture that combines integrated RFID, direct part marking (DPM) and barcode reading, the MC9190-Z provides enterprise customers with a lower total cost of ownership. RedBeam has announced that their Asset Tracking application has achieved Motorola Enterprise Mobility Validation on the Motorola ET1 Enterprise Tablet. Up to now, all devices certified for use with RedBeam have been Windows Mobile-based. This is the first Android mobile computer certified by RedBeam, as well as the first tablet device. 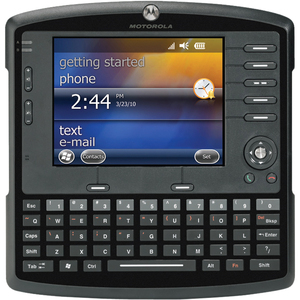 Motorola today introduced the new VC6090 vehicle-mount mobile computer to help improve the productivity and accuracy of warehouse and distribution operations by enabling voice, data and bar code scanning capability in a rugged, size-optimized mobile form factor. The VC6090 provides the ideal form factor for tight-spaced lift trucks with an all-in-one design that maximizes space utilization and minimizes driver obstruction. With an integrated keyboard with large keys for workers using gloves and an easy-to- read touchscreen display, the VC6090 mobile computer can be viewed and operated in most warehouse environments, resulting in improved decision-making and reduced errors. Integrated voice and data on the VC6090 simplifies tasks for drivers and IT organizations and with Wi-Fi support, drivers can connect to any available wireless LAN (WLAN) inside an enterprise campus or when in range of access points. Rugged enough to handle any environment the VC6090 is also designed to withstand the constant vibration associated with vehicle mounting. In order to get the most out of your investment, the VC6090 is available with the Service from the Start with Comprehensive Coverage program, providing coverage for normal wear and tear as well as accidental damage to internal and external components, significantly reducing unforeseen repair expenses. Motorola Solutions and Psion announced that they have agreed on the terms of a recommended offer by Motorola Solutions for a buyout of all Psion stock shares. Psion has been a pioneer in ruggedized mobile computing products and their application in industrial segments around the world. With headquarters in London and a major operational presence near Toronto, Canada, Psion has been a leader in mobile computing solutions since 1980. Psion has approximately 830 employees, customers in more than 50 countries.